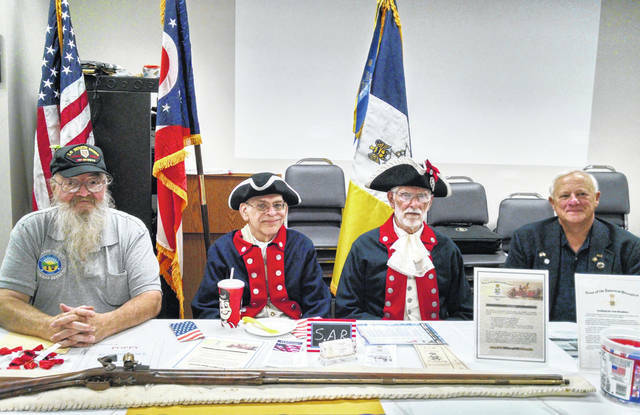 The Highlanders Chapter of the Sons of the American Revolution, which includes residents of Highland, Adams and Brown counties, recently received the national USS Stark Memorial Award for chapters with 10 to 49 members. In 1988, the SAR authorized the USS Stark Memorial Award to memorialize those brave men and women who continue to stand at the forefront to preserve the freedoms our patriotic ancestors fought so long and hard to achieve. Its purpose is to recognize outstanding SAR chapters and societies for their exceptional support of the activities of the SAR Veterans Committee and in serving the veteran community. Accepting the award for the Highlaners is Hillsboro area resident Gerold “Buzzard” Wilkin, left. https://www.timesgazette.com/wp-content/uploads/sites/33/2019/04/web1_Highlanders-Award.jpgThe Highlanders Chapter of the Sons of the American Revolution, which includes residents of Highland, Adams and Brown counties, recently received the national USS Stark Memorial Award for chapters with 10 to 49 members. In 1988, the SAR authorized the USS Stark Memorial Award to memorialize those brave men and women who continue to stand at the forefront to preserve the freedoms our patriotic ancestors fought so long and hard to achieve. Its purpose is to recognize outstanding SAR chapters and societies for their exceptional support of the activities of the SAR Veterans Committee and in serving the veteran community. Accepting the award for the Highlaners is Hillsboro area resident Gerold “Buzzard” Wilkin, left.